Afterwards, Dr. Norka Ruiz Bravo, Deputy Director for Extramural Research, National Institutes of Health, issued an official statement calling this “terrorism” and defending Novy’s research. Although the process of labor is better known in species such as the sheep and rodent, what controls the initiation of labor in the human is still unclear. To better understand what occurs in the human, Dr. Novy's research uses monkeys, an animal model closer to that of the human. Dr. Novy's research is fundamentally important to help prevent early preterm delivery that can result in devastating effects on newborn children and their quality of life in later years. This reeks of fanaticism. No research can be fairly claimed to be fundamentally important prospectively. One can claim after the fact that some discovery was fundamentally important, but claims regarding on-going research must always be couched in could or might or hopefully. His current research involves preventing one of the major causes of premature birth: infections associated with preterm labor. Our data provide evidence for a cause-and-effect relationship between intraamniotic infection and preterm labor and support the utility of measuring interleukin-6 or other cytokines in the diagnosis of intraamniotic infection. The importance of this research cannot be underestimated. Premature birth is a serious public health problem. Approximately 12% of all babies are born premature with 2 % of all babies, or approximately 100,000 babies, being born very premature. Regrettably, these very premature babies are associated with the highest mortality and morbidity rates. Ten percent of these babies will die. Fifteen percent of these babies with have serious permanent disabilities such as cerebral palsy, mental retardation, deafness or blindness. Fifty percent of these infants will have a moderate learning disability and 7 % with have a behavioral problem. Besides its human toll, the financial toll for total hospital stays for premature infants is about $15 billion dollars per year and represents approximately half of all infant hospital stays. Furthermore, the economic burden does not end after hospital discharge for those with a disability. By this measure, Novy’s work seems to have failed quite miserably. NIH-supported scientists like Dr. Novy are accountable for protecting the welfare of animals in research from the time they develop their first research plans to the time the research is completed. This bit of pandering isn’t even very accurate. USDA has reported that the oversight system cited by Dr. Bravo is largely a failure, and the only blinded peer reviewed evaluation of the system has deemed it no more reliable than the flip of a coin. Animals are critical to the acceleration of biomedical discovery of medicines, therapies, and cures — threats to research with animals threaten the health of the nation. This is more fanaticism mixed with a good dose of voodoo. Apparently, some magic occurs by the very act of vivisection -- some bit of magic that maintains the “health of the nation.” If we stop torturing animals in laboratories the sun may not rise. The article focuses on the recent harassment of primate researchers at the University of California, Los Angeles: Arthur Rosenbaum, Lynn Fairbanks, Dario Ringach, and Edythe London, but never mentions – in any detail whatsoever – what these people do or have done in the name of science that others find so grotesque and cruel. Rosenbaum’s research using animals is described thusly: “He has ties to only one animal-research project, a pilot study to test an electrical stimulator that could bring paralyzed eye muscles back to life.” Compare that with my own description of his research. Based on parameters from human and our monkey pharmacokinetic studies, we modeled a prevalent human METH exposure of daily multiple doses in socially housed vervet monkeys. METH doses were escalated over 33 weeks, with final dosages resulting in estimated peak plasma METH concentrations of 1-3 muM, a range measured in human abusers. With larger METH doses, progressive increases in abnormal behavior and decreases in social behavior were observed on 'injection' days. Anxiety increased on 'no injection' days while aggression decreased throughout the study. Thereafter, during 3 weeks abstinence, differences in baseline vs post-METH behaviors were not observed. In a 1 November editorial in the Los Angeles Times, she wrote that her research on the biological basis of addiction--which focuses on human brain imaging but also involves some work with primates--was motivated in part by the death of her father, a chronic smoker. “We are also testing potential treatments, and all of our studies comply with federal laws designed to ensure humane care” of animals, she wrote. Compare this with my own previous description of her work. In all fairness (as if Science cares about fairness or accurate reporting on this issue) the article seems to have been intended to frighten vivisectors into urging their universities to get tough and to find ways to protect them. It clearly wasn’t intended to inform readers about why some people feel that they have so few options when it comes to voicing their opinions about the use of primates or other animals in science. There is much irony in the article, but a reader would have to be reasonably well informed to see it, so most Science readers probably missed it. It’s almost a given that vivisectors claim publicly that statements made concerning their work are uninformed, no matter how absurd they appear by doing so. 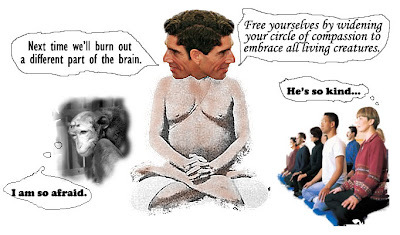 For instance, at a public lecture Richard Davidson recently asserted that a critic of his primate experiments didn’t have her facts straight regarding the invasive nature of his experiments, even as she held in her hand a copy of an abstract in which he described burning away various parts of monkeys’ brains with acid. The Science article noted that some vivisectors are calling for greater obscurity in the CRISP (Computer Retrieval of Information on Scientific Projects, a searchable database of federally funded biomedical research projects.) In other words, they don’t want critics to speak with specificity or accuracy. Another bit of irony in the article is that UCLA is willfully flouting federal and state statutes concerning public access to information. Most advocates of democracy acknowledge the prime importance of transparency in government and the public’s right of access to public records. Yet, UCLA has flatly denied access to public records to members of the public, and Science says this is a model being used increasingly by other universities to shield their researchers’ activities from public scrutiny (and possible criticism.) The University of Wisconsin simply destroys records it deems too controversial for public inspection. When activists break the law, UCLA et al call it terrorism. Science could (but probably won’t) embrace the best things about science: it could (but probably won’t) foster a genuine public discussion and a reevaluation of the human/animal relationship based on a modern informed scientific evaluation of other species’ minds. Even hardboiled scientists can express fact-based opinions for why we should acknowledge the most fundamental rights of other humans; bigots (like vivisectors and apparently, the editors of Science)base their beliefs and behavior on unexamined non-factual claims and unexamined tradition. One final note: if you think I’m too hard on the editors of Science, consider the journal’s willingness to cover Jane Goodall and her work and their marketing decision to use a chimpanzee dressed in a costume to sell subscriptions. The woeful lack of sensitivity this implies fits neatly into a pattern of disregard for other animals no matter how complex their mental lives might be. Dalai Lama Disciple Makes Big Discovery! Pretty embarrassing? It’s outrageous. But what should embarrass Wineke and the paper he writes for, is his and the paper’s studied silence on the University of Wisconsin’s own destruction of 628 videotapes on Feb. 13, 2006, documenting over 15 years of experiments on monkeys. It was a cover-up plain and simple. The university is frightened to death at the prospect of being before the court of informed public opinion. Public officials hiding the truth and trying to keep the public in the dark isn’t, in-and-of-itself, a worrisome matter to Wineke or his paper, apparently. He ought to be embarrassed. From June through December 1997, I protested for ten days at a time at each of the (then) seven (then) Regional Primate Research Centers. (There are now eight National Primate Research Centers.) In December, the Vilas monkey scandal was well underway and the University of Wisconsin spin-doctors were busy presenting a cacophony of random and unsubstantiated reasons to various Dane County committees arguing that they should not endorse an introduced resolution regarding the care and protection of the monkeys at the zoo. In early December, I drove to the last stop of my eight-month-long ordeal, Emory University, in Atlanta, home of the infamous Yerkes Primate Center. One evening, a reporter showed up at my encampment and ask us if we had heard that a research assistant had been hospitalized following her exposure to a monkey virus. Elizabeth R. Griffin had been splashed in the face with fluids while transporting an infant rhesus monkey. She reported the incident and was told to wash her face. A few days later, she called in sick with flu-like symptoms, felt so sick that she went to the Emory hospital and was given some aspirin and told to rest in bed. A short time later she developed encephalitis and died. She had been infected with the so-called simian B-Virus, also known as herpes-B, or Cercopithecine Herpesvirus-1. The virus is considered to be common and widespread in macaques. Yerkes wrote the OSHA requirements for workers handling macaques and the standard procedures following any possible exposure to the virus, none of which were followed in Beth Griffin’s case. She was not wearing the required protective eyewear and follow-up to her exposure was non-existent. OSHA fined Yerkes over $60,000 for its failure to provide the proper training and safety equipment needed to protect workers from B-Virus infection. The B-Virus, though potentially fatal in humans, and widespread in macaques, is also very rare in humans. In Asia, macaques and humans live intimately with few if any apparent infections; in the US many people keep macaques as pets. As of 1999, of the 22 known cases in the US, 20 infected individuals developed encephalitis and 15 of these patients died as a result of their infection. When I returned to Madison, I visited the Vilas zoo monkey house and observed an unusual event. 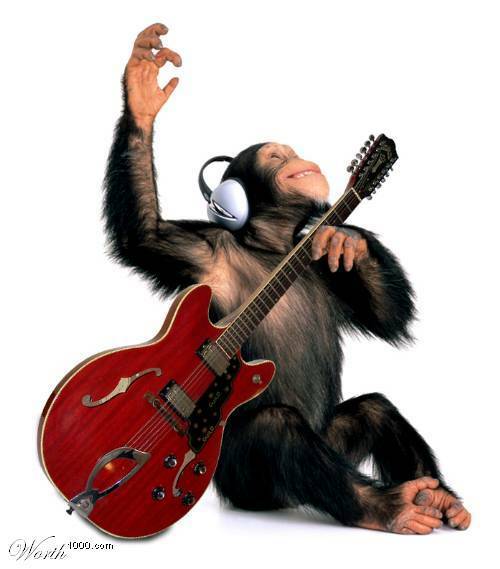 Apparently, the primate center had elected to remove a contraceptive device that all the female monkeys had implanted. It might have been Norplant. Exactly why they chose to end the contraception is unknown – stupid and/or calculating of course – but unknown. Once removed, all the females spontaneously went into estrous and the males went berserk. As I stood watching, the primate center staff zoo monkey keeper was in one of the large monkey rooms in his lab coat with a broom. He had no face protection on of any kind. There was blood everywhere and male monkeys continuously charged each other screaming and biting. He was using the broom to try and keep them apart. The melee continued until he was able to get some of the males separated and isolated from each other. It was a regular riot. Coincidentally, yet another Dane County committee was meeting that very evening to consider the resolution. I attended the meeting as did primate center staff. Acting Director Kemnitz and some of his staff spoke in opposition to the resolution. I don’t recall all the committees the resolution had to get through, but it seems like it must have been at least four or five, and this was one of the last ones prior to the resolution going before the entire Dane County Board of Supervisors. Up to this point, the university had been saying that caring for the monkeys was just too technically challenging for the county, that the expense would be too great, that unless the county allowed the monkeys to breed that no one would be interested in them, and other various and spurious claims. But at this meeting, they pulled out a new shiny big gun: If Dane County took over the care of the monkeys they would be putting every zoo patron at grave risk of contracting the deadly B-Virus, and then they launched into the most vile fear-mongering that one could imagine. Overnight, monkeys who had been at the zoo for over 30 years had become a public health hazard on the order of an open pit nuclear waste site. Beth Griffin’s name became their club and they used her death to try and beat down any idea of some modicum of concern for the monkeys. They went on at length about the extreme danger of the monkeys and the careful and grueling training and safety procedures used by all the primate center staff. Afterwards, I stood up and recounted the scene I had viewed at the zoo: lots of blood, pandemonium, and no face protection. Like every other of the County Board of Supervisors’ committees that had considered the resolution, this committee endorsed it unanimously. They saw through the university’s theatrics and lies once again. Barely a week goes by without someone posting something to one of the primate email lists about some ad agency or similarly unenlightened ignoramous using monkeys or chimpanzees in advertising in ways that reinforce the idea that they are mere things to be used, to be laughted at, to be discounted. 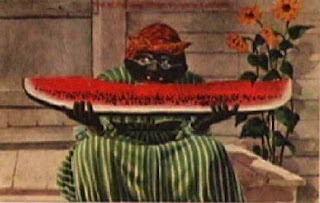 Stereotyping is partularly distatesteful when it done to demean or meant to communicate a belittling caricature as in this typical image of the happy "mammy." It's natural to assume that any organization using such imagery must be ignorant of the realities behind the scenes of animal use in entertainment, the difficulties in establishing even a modicum of societal concern for them, the power of demeaning imagery, or else they must be be so callous as to simply not care at all how their advertising decisions might affect others. In spite of all of this, the university refused to take responsibility or to affix blame. 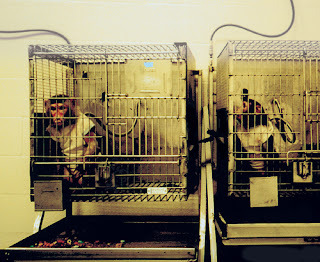 They lied to the residents of Madison for eight years, allowed at least 201 monkeys to be hurt and killed after promising not to do so in writing, on three separate occasions, and then violated the agreements again openly and very publicly by having most of the remaining monkeys shipped to Tulane university for use in its invasive and terminal primate experimentation. And no one was ever held accountable. No one took responsibility. Upon being caught in such a big lie, they continued lying, protected each other, and sent the remaining monkeys off to be killed, all the while lying anew about how the monkeys would be used there and saying in public meetings that Tulane was very excited about having such large intact social groups to study. They lied repeatedly, in writing, and in public presentations to a multitude of reporters, citizens, Dane County committees, and the entire Dane County Board of Supervisors. The university’s response to being caught in such a long series of lies was to keep lying, to make up more lies, and to refuse to do anything remotely resembling making amends. Officials associated with the Henry Vilas Zoo say they are concerned about the UW's reluctance to determine who authorized invasive research on dozens of monkeys raised at the zoo. "One of the things expected of a person as an elected official is makingsure answers are provided," said Madison Ald. Napoleon Smith, who serves on the Dane County Zoo Commission. "Only the university can provide those answers, so we're all awaiting them." Earlier this month, The Capital Times reported that invasive experiments were conducted on dozens of monkeys raised at the zoo, despite written promises by UW Primate Research Center officials that the monkeys would not be harmed. And, the lies have not slowed down one iota as we can readily see by comparing the cases of Jennifer Hess and Ei Terasawa (here, here, and here) with university’s oft-intoned mantra that they treat the animals well and with respect and concern. A sad message in all of this is that no matter how much the University of Wisconsin, Madison lies to the public about its use of animals, the public forgets almost immediately, or doesn’t pay attention in the first place. Fool me once shame on you. Fool me continuously; I must be an idiot, which of course, is exactly how the university views the average Madisonian.